This document describes the release of ASP.NET and Web Tools 2013.1 for Visual Studio 2012. Install ASP.NET and Web Tools 2013.1 for Visual Studio 2012. You must have either Visual Studio 2012 or Visual Studio Express 2012 for Web. When you scaffold MVC 5 controllers and views, the markup for the views uses Bootstrap. We added a new MVC 5 template. It references the latest MVC 5 NuGet packages, and you can use scaffolding to add controllers and views. We added a new Web API 2 template. It references the latest Web API 2 NuGet packages, and you can use scaffolding to add controllers and views. We added new item templates for MVC 5 views, Web Pages (Razor 3), and Web API 2 controllers. They install the related NuGet packages to the project while adding new items. When you scaffold an MVC or Web API controller using Entity Framework, we use Framework 6. For more information about Entity Framework, see the Entity Framework Version History. You can also download and install the Entity Framework 6 Tools for Visual Studio 2012. See the Get Entity Framework. ASP.NET Scaffolding is a code generation framework for ASP.NET Web applications. It makes it easy to add boilerplate code to your project that interacts with a data model. In previous versions of Visual Studio, scaffolding was limited to ASP.NET MVC projects. With this update, you can now use scaffolding for any ASP.NET project, including Web Forms. This update does not support generating pages for a Web Forms project, but you can still use scaffolding with Web Forms by adding MVC dependencies to the project. Support for generating pages for Web Forms will be added in a future update. When using scaffolding, we ensure that all required dependencies are installed in the project. For example, if you start with an ASP.NET Web Forms project and then use scaffolding to add a Web API Controller, the required NuGet packages and references are added to your project automatically. To add MVC scaffolding to a Web Forms project, add a New Scaffolded Item and select MVC 5 Dependencies in the dialog window. There are two options for scaffolding MVC; Minimal and Full. If you select Minimal, only the NuGet packages and references for ASP.NET MVC are added to your project. If you select the Full option, the Minimal dependencies are added, as well as the required content files for an MVC project. Support for scaffolding async controllers uses the new async features from Entity Framework 6. For more information and tutorials, see ASP.NET Scaffolding Overview. These tutorials show scaffolding with Visual Studio 2013, but they are also applicable to ASP.NET and Web Tools 2013.1 for Visual Studio 2012. With this update, Visual Studio 2012 now supports Razor 3 tooling/editing. This version of NuGet removes the need for users to explicitly allow NuGet to restore missing packages. When installing NuGet 2.7, users implicitly consent to automatically restoring missing packages. Users can explicitly opt out of package restoration through the NuGet settings in Visual Studio. This change simplifies how package restoration works. If you encounter an error when adding a scaffolded item to a project, it is possible your project will be left in an inconsistent state. Some of the changes made be scaffolding will be rolled back but other changes, such as the installed NuGet packages, will not be rolled back. If the routing configuration changes are rolled back, users will receive an HTTP 404 error when navigating to scaffolded items. To fix this error for MVC, add a new scaffolded item and select MVC 5 Dependencies (either Minimal or Full). This process will add all of the required changes to your project. Add the following WebApiConfig class to your project. If Visual Studio Express 2012 for Web stops working after adding scaffolded item with Entity Framework (such as Web API 2 Controller with actions, using Entity Framework), it is possible that Visual Studio Express failed to load the native image of an assembly dependent on System.Web.Extensions. Open Command Prompt in the Administrator mode. Go to %ProgramFiles%\Microsoft Visual Studio 11.0\Common7\IDE or %ProgramFiles(x86)%\Microsoft Visual Studio 11.0\Common7\IDE (for 64 bit Windows). Open VWDExpress.exe.config in a text editor. Restart Visual Studio Express 2012 for Web. To resolve this issue, change the Start Action setting in your project to Specific Page. You do not need to provide a value for the page. After making this change, selecting F5 navigates to the root of your application (http://localhost:XXXX). This behavior is not the same as the behavior for MVC 5 projects in Visual Studio 2013, where the Current Page setting launches the open page. After upgrading to ASP.NET Razor 3 or ASP.NET MVC 5, the tilde(~) notation may no longer work correctly if you are using URL rewrites. The URL rewrite affects the tilde(~) notation in HTML elements such as <A/>, <SCRIPT/>, <LINK/>, and as a result the tilde no longer maps to the root directory. For example, if you rewrite requests for asp.net/content to asp.net, the href attribute in <A href="~/content/"/> resolves to /content/content/ instead of /. To suppress this change, you can set the IIS_WasUrlRewritten context to false in each Web Page or in Application_BeginRequest in Global.asax. When you create ASP.NET MVC projects with Visual Studio 2012 on Windows 8.1 or Windows Server 2012 R2, Visual Studio displays an error message that states "Configuring Web [url] for ASP.NET 4.5 failed." You see this error because Visual Studio 2012 does not enable the ASP.NET 4.5 feature when it is installed on those releases of Windows. 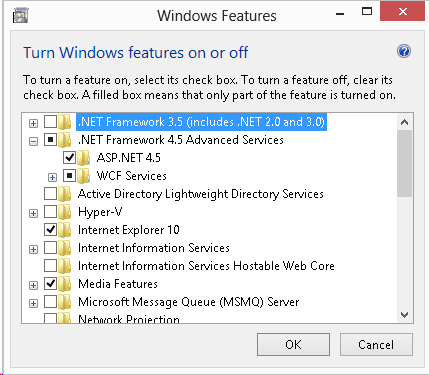 To enable ASP.NET 4.5, perform the steps described in Turn Windows features on or off. Alternatively, you can enable ASP.NET 4.5 through the command line. Run the following command to enable ASP.NET 4.5.